I always describe my life as "organized chaos". While generally quite a neat person, there are some things that just have to be messy for me to work. Now, from this book, I learn that it's okay to be messy. There are even people who can help you sort out your mess, if you so choose. This book relates stories of such people, seminars you can attend to learn how to clean up your mess, and so on. However, this is not just about being "messy". 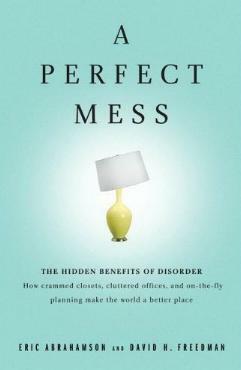 Who knew there were chaos theorists or a "science of mess", or that, "according to a survey conducted by professional staffing firm Ajilon Office, office messiness tends to increase sharply with increasing education, increasing salary, and increasing experience." While we all know organization leads to efficiency, it's not always applicable to everyone. It's perfectly okay to have a little mess around you, especially if you function well (or better) for it. I've seen, as was discussed in the book, neat freaks nearly blow their stacks because of a little disarray. I've also witnessed messy people do extremely well. I did not finish reading this book. Conclusion - Quite interesting to see both perspectives.